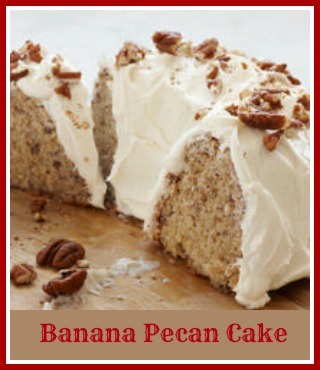 Who doesn’t love a Banana pecan cake? It is moist and just delicious. This great recipe is easy to make and tastes wonderful. I’ve used reduced fat cream cheese on the frosting, and unsweetened applesauce in the cake mix, to cut down the calories a bit. The pecans add a nice crunch and the cream cheese frosting is wonderful as always. It makes a nice addition to the banana flavor. Do you like the taste of bananas and pecans? Turn ripe bananas into tonight's dessert with this delicious banana pecan cake with a cream cheese frosting. Bake at 350 degrees for 45 - 55 minutes depending on your oven and pan. Start checking at 35-40 minutes and remove when toothpick inserted into center of ring comes out clean. To make the frosting, blend cream cheese, and butter. Gradually add the confectioners sugar and beat until light and fluffy. Beat in the vanilla extract. When the cake has cooled, sprinkle it with 1/2 of the chopped pecans. Spread the prepared frosting over the cake and top with the remaining pecans. Finish the top with a few banana slices just before serving.